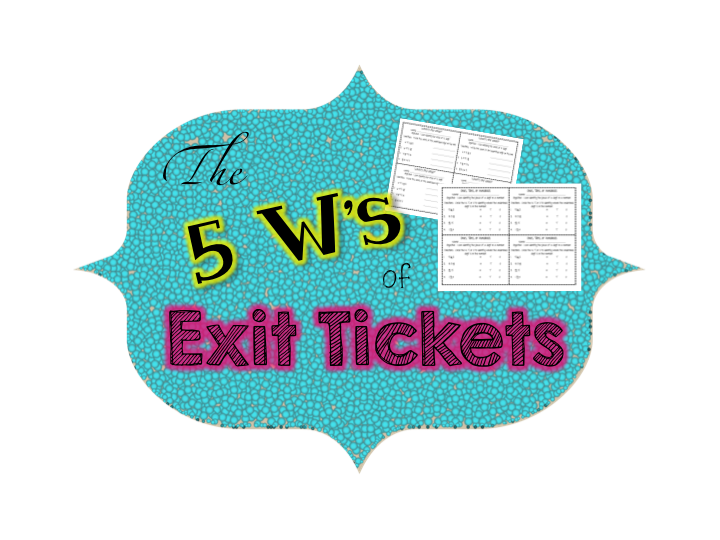 What: What ARE exit tickets? 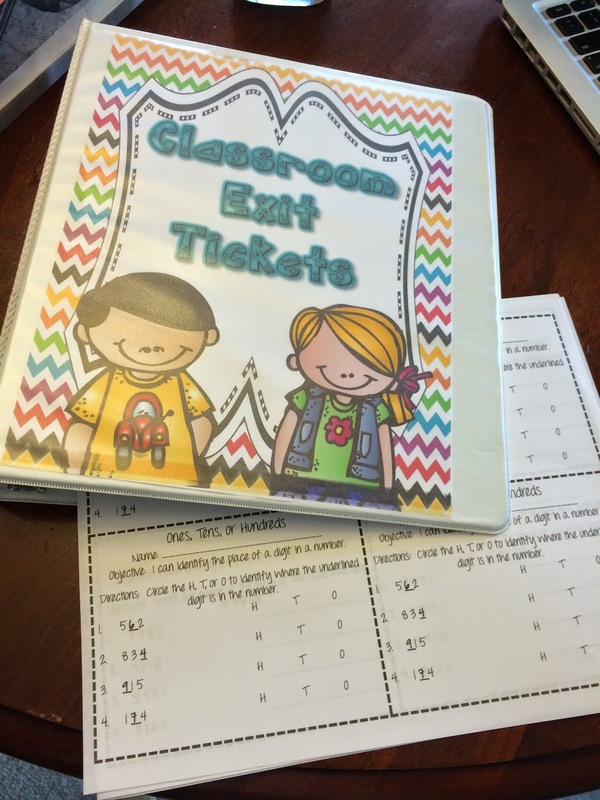 Exit tickets are a quick and easy way to gather immediate data at the end of a lesson. They can be formal (something you found online, paid for, printed, etc) or they can be very on the spot and informal. 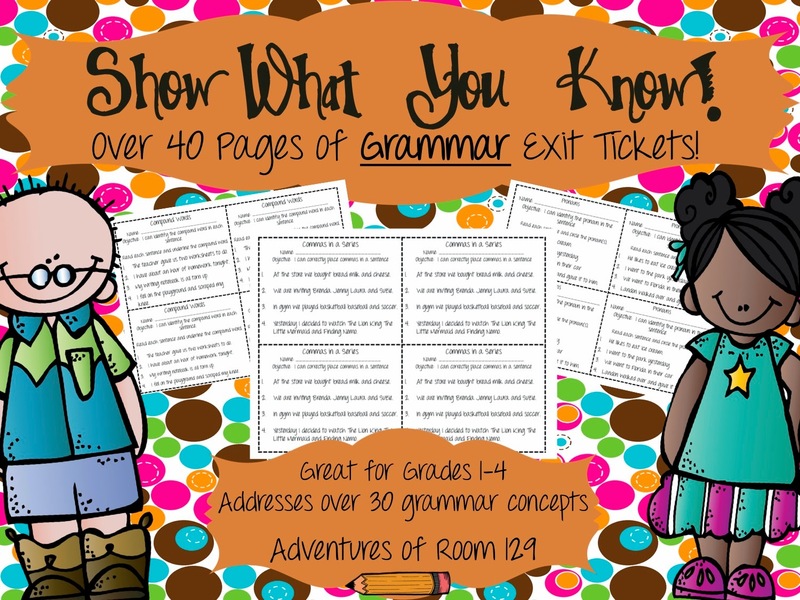 The exit ticket is like a snapshot of what the students learned from the lesson that is about to end (or begin, but we'll get to that in a bit!) They can easily be differentiated as well. My informal exit tickets are always on post it notes. Students pull them out, I write a question on the front board, they answer and bam, we're done! The great thing about exit tickets is that you can ask ANYTHING! They can be used in any subject and can contain work or more open ended writing type answers. Basically, there's no need for students to take more than 5 minutes to show you what they learned. If they can show you in 1-4 questions or 1 open ended writing question, then they've got it and you've got the data to use to decide where to go next with your lessons! WHO: Who are exit tickets for? 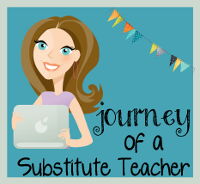 Most teachers think that exit tickets are for the teacher - which is very true, but I see them as being not just for me but also for the student. How are they 'for the teacher'? Exit tickets are a FANTASTIC way to get immediate proof as to whether or not your students have grasped the concept you just taught. This give the teacher data to use as soon as they need it. 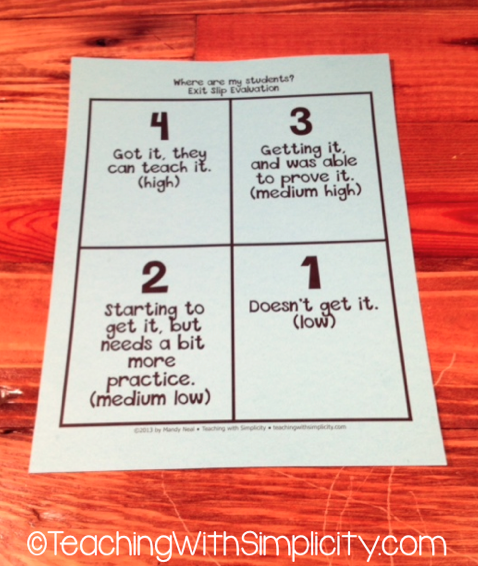 No more waiting until 'the test' to see if your kids understand what you've been teaching. By then, its too late! If I'm going to spend 20-30 minutes on a lesson, I don't want to move on or walk away from that lesson without knowing what they got and what they didn't. So yes, they are for the teacher. But - they are also for the students! How? What better way to open up a lesson than with showing the students their exit tickets from the prior day's lesson. Boost some confidence by putting a few students' exit tickets under the document camera and 'review' the concept by showing their amazing work. Or - do the opposite, cover up the name of a student's exit ticket who didn't do so well and review those mistakes that this student made to the whole class (not identifying the student of course). Show the students the data you collected - they'll understand it. It will help them answer the question of "Why are we still learning this? We just did it yesterday!" 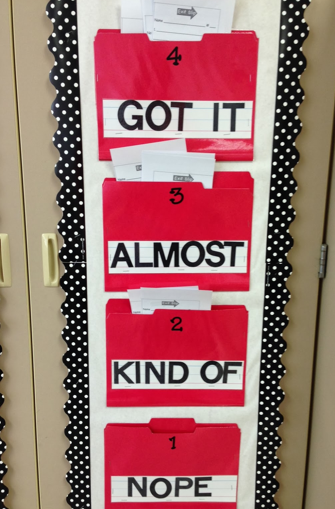 Another idea - pass back the exit tickets and have the students pair up to grade them. 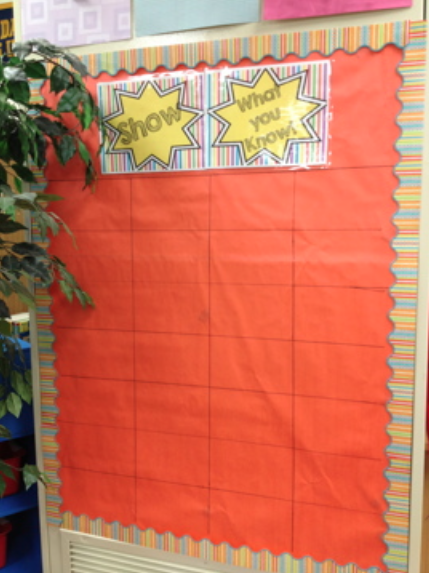 Analyze the data together to give your lesson opener a meaningful kick! So you see, they are for both the teacher and the student! Where? Where to go after giving an exit ticket? 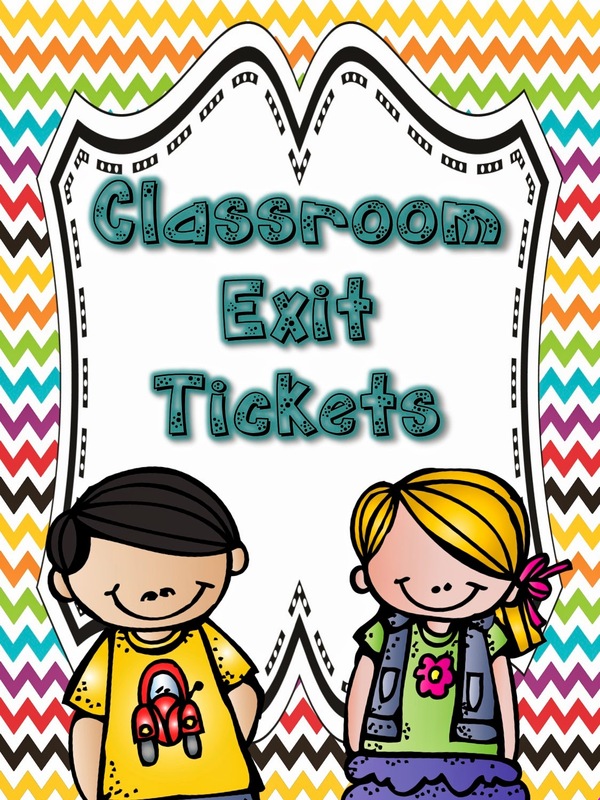 One problem I know a lot of teachers have is where to go after they've given an exit ticket. Congrats - you gave one, now what? Giving the exit ticket is just the first step of the process - its what you DO with the data afterwards that makes them meaningful. I've ALWAYS said to other teachers - if anyone ever wanted to observe me teaching they would need to stay until I leave school because a lot of the 'magic' happens when the kids leave and I'm going through exit tickets for the day and revamping plans for the next day. You can't just give them and walk away or let them go to the bottom of your 'to grade' pile. Then they're meaningless. The purpose of an exit ticket is to have that immediate data to use to guide your next lesson, whether that's the next day - in small groups - or in a few weeks when you revisit the skill. Before I leave my room, you better believe my baskets are emptied out and I have sat and gone through them. What do I do with them? Before I found this GENIUS way to sort them, I simply used paperclips and post its to write notes on who has it and who doesn't. 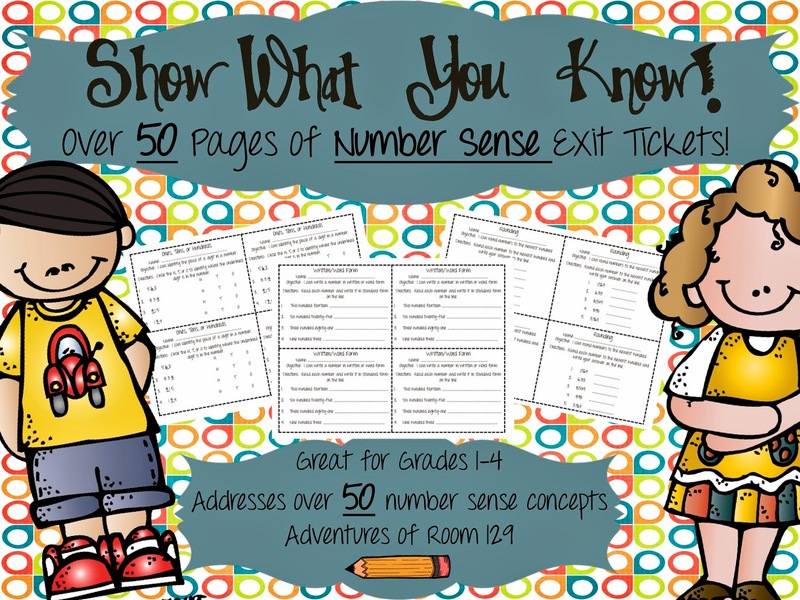 But take a look at this amazing and easy way to sort your exit ticket (brought to you by Teaching with Simplicity). Place a few paperclips and boom - you've got them saved, sorted, and ready to go! 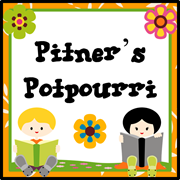 Now you have your groups ready for small group lesson. Now you know who to conference with. Now you know who to push on and give enrichment lessons to. USE YOUR DATA!! When: When do I give exit tickets? 99% of the time, exit tickets are given at the end of the lesson. Makes sense. But let's talk about a few other ways you can use them. Why not at the beginning of the lesson? I do this a lot more in math than I do in reading. I'll post one problem on the board and give the students 2-3 minutes to complete. As they bring them up to me I sort them. Then, during my entire lesson I know who to ask specific questions to, who to give higher order questions and problems to, who and how to group the students during practice. It makes the the lesson go so strongly and with a purpose. And all data driven! Or - what about in the middle of a lesson? Who is to say you can't stop a lesson at about the 1/2 way point and ask a question, collect, and use the data to end your lesson. Same process - just now end your lesson with a BANG! Once I have given the tickets (if at the end of a lesson) I have the kids do a quick reflection on how they think they did. This is simply added data to use and discuss with them once I've analyzed the data myself. Check out this adorable and easy set up I plan to use this year. Here's what I did with my exit tickets last year. Each child had their own square and a small magnet (not shown). When done, they posted it to their space. Easy peasy! Click on the photo to grab the "Show What You Know" posters for free! You can also use this really fun and easy way to collect them! I think the better question is - why not? Why would you not use SOME form of an exit ticket after knowing all of the rhyming and reasoning behind them. They are a part of that teaching 'magic' that takes place. It's one thing to teach - its another to use data to drive your instruction and give each child their individual and meaningful education they deserve. So there you have it. Idk if you learned anything new or not - maybe I'm preaching to the choir? I'm in the process of putting all of my new exit tickets in one binder (with a cute cover and tabs of course!) for easy access. Download the cover if you'd like a copy! Just click on the photo below. Well, that's all for me now folks - TTFN! 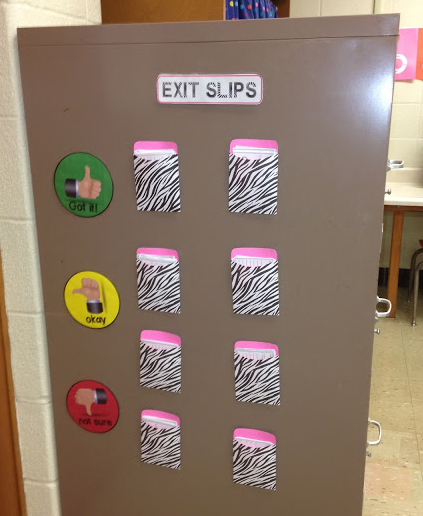 Very informative and thorough case for exit slips. Thank you! Thank you very much!! I'm so glad you found it helpful! Excellent post on exit tickets! I may just knick a few of the ideas! I'm trying to use them more in connection with cooperative learning.